I am — ashamedly — a member of the Lean Cuisine lunches club. For some reason, my biggest temptation to overeat is lunchtime, and those darn handy little meals prevent me from doing it! Every once in awhile, I feel guilty about eating all the nastiness in those meals, and I make myself something at home. It’s always tasty — but unfortunately, the frozen meals continue to provide me with more variety than I can afford to provide myself during the week for lunches! This salad is delicious and it’s a total meal in one package. I’m labelling it Mexican, but like Liz before me…well..it isn’t really mexican, per se. It’s just darn tasty! – Cook the rice according to package instructions. Cool completely. 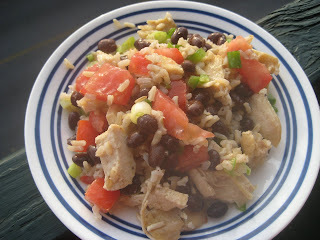 – Place cooled rice in a large bowl; add chicken, beans, tomatoes, scallions, jalapeno, vinegar, oil, and cumin. 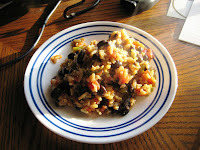 This rice dish looked like it was right up my alley — unfortunately, I didn’t particularly care for it. I may try it again…we’ll see. 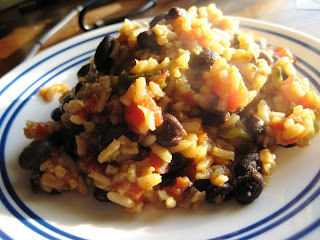 *Warning: This recipe makes A LOT of rice — Tori says 8 cups prepared — so if you don’t want leftovers, or aren’t sure…I highly reccomend making half. Baked beans can sometimes be like macaroni and cheese — everyone’s got a different recipe, and everyone likes theirs best! We usually served these beans as one of our many sides at 4th of July picnics, Memorial Day get-togethers, and every other excuse we could find to bring family members together to eat during the summer. Since I now live far away from my family, I made these this week to reminisce — it just wasn’t the same without the countryside and family around! 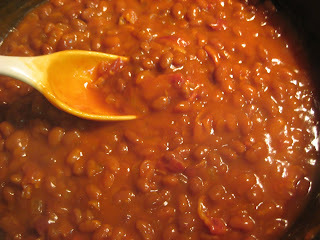 These beans are described as “two ways” because you can cook them two different ways, depending on your preference, time, etc. – Bake for 1 hour, uncovered, at 350 degrees. Stir the mixture 1/2 hour into baking.